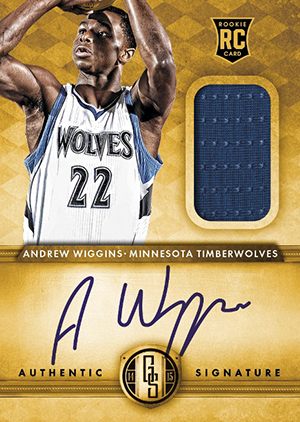 2014-15 Panini Gold Standard Basketball is the Midas of the hobby. Every aspect of the high-end product ties into the gold theme. Single-pack boxes come with five hits including a Rookie Jersey Autograph and at least three more signed cards. Also, everything in the product, from base cards to autographs to memorabilia cards, is serial numbered. And did we mention there's a gold theme? 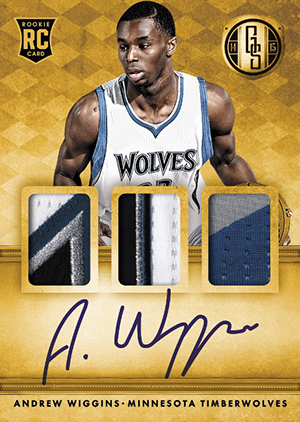 Rookie Jersey Autographs aren't new to Gold Standard, but Panini is changing things up a bit with dual- and triple-swatch versions to go along with the regular ones. Prime versions with premium swatches are numbered to 25. There are also one-of-one tags including NBA logos. Among the autographs are AU. Numbered to 79, they don't come with a periodic table but the signatures are on-card and the design uses etched foil. 14K Autographs also come hard signed. Good as Gold mixes autographs and memorabilia. 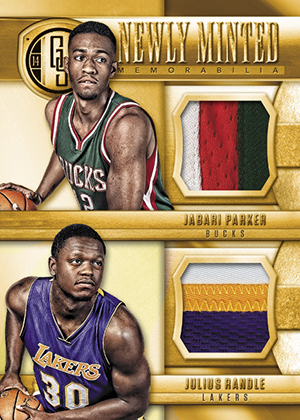 Newly Minted Memorabilia Duals come with multiple swatches of player-worn gear from 2014-15 rookies. Other memorabilia sets include White Gold Threads and Black Gold Threads. 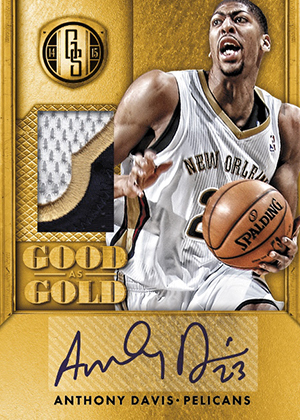 2014-15 Panini Gold Standard Basketball doesn't just use "gold" to name the set's various parts. Although rare, there are cards that have actual gold. 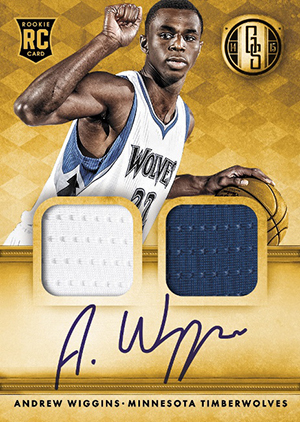 Freshly Minted (#/20) highlight rookies once again and have a small gold disc embedded in it. Solid Gold are just that -- cards made of gold. Each is a one-of-one. The set doesn't have one base set variation theme, it has two. The first sticks with past Gold Standard releases, showing players on the different teams they've played for throughout their careers. 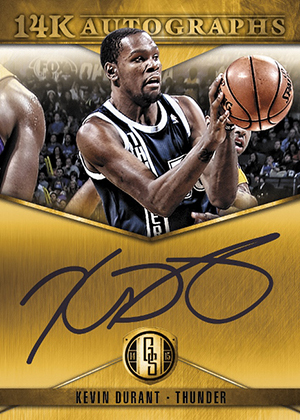 2014-15 Panini Gold Standard Basketball also has standard photo variations. The following images are mock-ups and not final cards. Designs and content are subject to change. Panini has some live images posted on their blog. 200 cards. Serial Numbered #/285. 33 cards. Serial Numbered #/199. 33 cards. Serial Numbered #/149. 33 cards. Serial Numbered #/99. Click here for a detailed variations guide. 33 cards. The print run for each player totals 285 copies, regardless of the number of versions. Click here for a detailed variations guide. 66 cards. Serial Numbered #/79. 50 cards. Serial Numbered #/7. 25 cards. Serial Numbered #/20. 35 cards. Serial Numbered #/50. 44 cards. Serial Numbered #/25. 33 cards. Serial Numbered #/25. 48 cards. Serial Numbered #/49. Each time I bring this in the airport, they opened my bag and thought it was a gold bar. Some think it was a chocolate, but the packaging for this is nice that it fools a lot of people. The metal card is great, but terrible when you are travelling. Gold Standard is a Fools Gold. 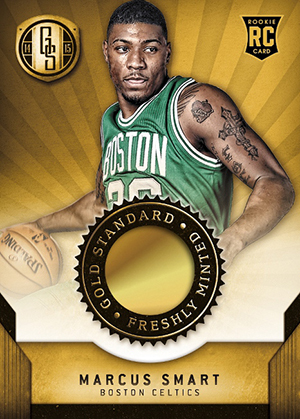 If you have to buy 3 products each year, Hoops is Tier 1, Prestige is Tier 2 and this one is Tier 3. A High End product that is affordable and value for money is maximized. The design is golden and I hope Panini stay true with this with consistency. On card autographs is a great way for this high end product. 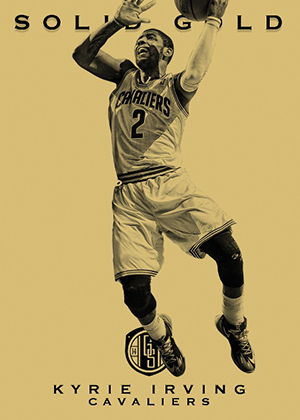 Rookies with this gold standard really is must for collectors. That is why it has a high rate of a sold out. Collation is a hit or miss. Sometimes when you open you get really terrible collation, but if you do get lucky you get that grand prize. Player selection is still terrible, at least Panini now is improving. I hope they keep only current All Stars from the last 2 years on their list and keep away from those “has been” players who are now bench warmers. Overall: If I have the money, I would buy a case of this. If you are a solid collector you would buy a case of this. True collectors actually try to complete this set. You get the autos while you are at it as a bonus. If you are a casual box buyer, then this is one you should not miss.